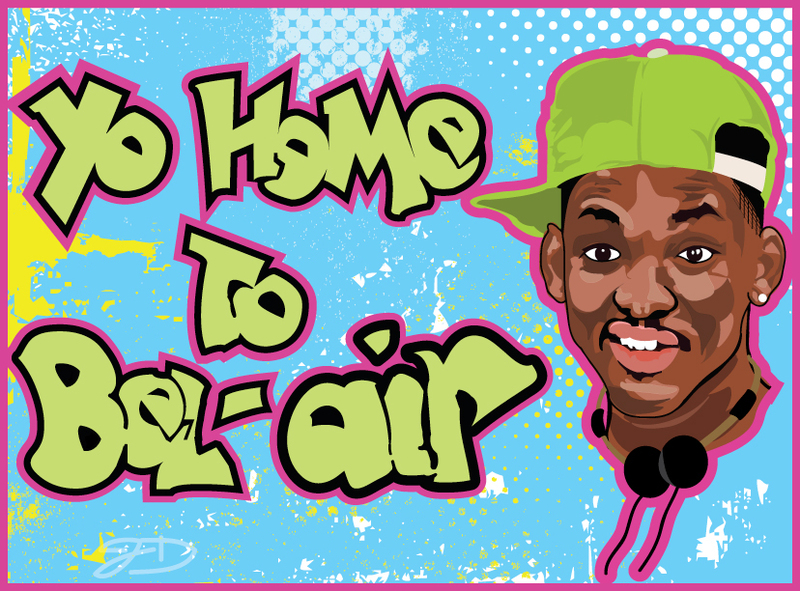 FRESH PRINCE OF BEL-AIR ILLUSTRATION! Back again to joedichiara.com with some new art! This month’s illustration was devised in anticipation of the new Men In Black III movie. Will Smith is one of my favorite actors, and anyone from my generation grew up with him during his pre-movie star days as a member of the Hip-Hop duo “DJ Jazzy Jeff & The Fresh Prince” and on the sitcom “The Fresh Prince of Bel-Air”. I previously did a illustration of the “Fresh Prince of Bel-Air” entire cast, but this go around I decided to focus on “The Fresh Prince” himself and apply a more digital feel to it. Check out the trailer to the new MIB3 movie, and see Will Smith discuss the “Fresh Prince” theme song and perform it. Can’t wait to see the new film. Enjoy!